Drinking mineral-rich vegetable broth is one of the simplest and least expensive ways to improve your health. It is one of the best methods of bringing the pH (a measurement of how acid or alkaline a body is) into balance. Mineral broth contains many different organic minerals especially sodium, potassium and calcium. These are the most important minerals in today’s society because the average person takes in too many acid-forming foods (meat, dairy, grains, sugar, and alcohol), causing our bodies using up our buffering minerals to restore alkaline balance, which are primarily sodium, potassium and calcium. As a result, our digestion is impaired; the liver, spleen, and pancreas are weakened; the immune system becomes compromised; we develop gallstones; and the bones and joints develop osteoporosis, arthritis and other mineral deficiency disorders. An over-acidic body is the beginning of most chronic disease conditions. One of the best ways to alkalise the body naturally and prevent arthritis, heart disease, cancer and diabetes is by consuming vegetable broths. 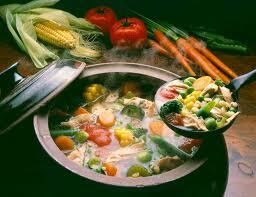 Chop vegetables then add all ingredients to a stainless steel pot. Bring to a light boil with the lid on then simmer for 30 minutes. Remove from the heat, allow to cool a bit and enjoy!